Last year we reported on USDA’s 502 Direct Loan Program, finding the Texas program poised to return funds allocated to the state in the American Recovery and Reinvestment Act of 2009. Our follow-up in June suggested the program had turned the corner, and was on track to improvement. The USDA 502 Direct Loan Program is designed “to provide low- and very low-income people who will live in rural areas with an opportunity to own adequate but modest, decent, safe, and sanitary dwellings and related facilities.”[i] ARRA nearly doubled the funds available to the program. We recently received the 2010 Fiscal Year end data on the program (via the friendly folks at the Housing Assistance Council), and USDA Texas has dramatically improved since our 2009 report. We estimate that USDA Texas used 98% of the funds allocated to the state, up from 63% in 2009. USDA Texas made $75.0 Million in 502 Direct Loans in FY2010, funding home purchases for 765 Texas families. 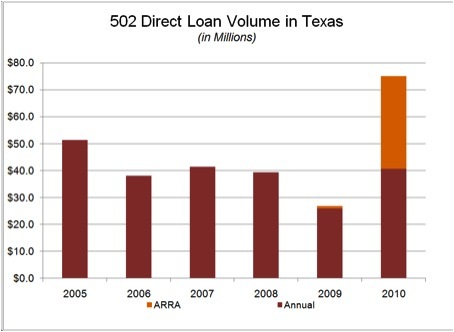 Including the loans made under the 502 Direct ARRA program, this represents nearly a threefold improvement over the FY2009 loan volume. Texas still lags the nation in funding 502 Direct loans to very-low income rural families, with only 34% of the loan dollars serving this population. USDA also fell short of serving this population nationally, with only 35% of its loan dollars reaching very low income borrowers. USDA has a statutory directive that 40% of its 502 Direct program dollars should serve very low income recipients. With the ARRA funds no longer available, the challenge going forward will be for Texas to maintain this momentum with its annual allocation of 502 Direct funds. TDHCA’s Rural Housing Expansion Program is a Housing Trust Fund program developing the capacity of local organizations to use programs like the 502 Direct program. We look to the Rural Housing Expansion program to help maintain a high utilization rate for the 502 Direct program in Texas. We compliment USDA Texas on their improvement regarding the 502 Direct program and urge them to continue their work serving Low and Very Low income Texans. This entry was posted in State issues and tagged 502 Direct, ARRA, HTF, TDHCA, USDA. Bookmark the permalink.